Amanda attended GVSU for both her undergraduate and for her physical therapy degree. After PT school Amanda travelled as a Physical Therapist for three years and has worked in a wide range of PT settings. She just celebrated her ten-year anniversary as a licensed Physical Therapist. 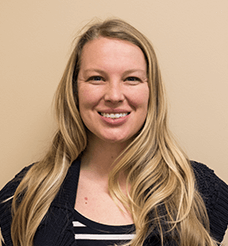 Amanda has experience with manual therapy, McKenzie treatment, women’s health- pain and pregnancy, vestibular, balance, Neuro- CVA, SCI and TBI, pediatrics, amputee, wound care, and golf/running. In her free time, she enjoys yoga, running and travelling all with her energetic 3 year old son and husband.